These wraps are made with beef from a friend's farm. We get our meat and eggs directly from an awesome young woman farmer, and I love it that we can support her in building her business. If you don't want to use beef, you could probably sub pretty much any ground meat you like. I think I may try doing them with pork sometime soon. 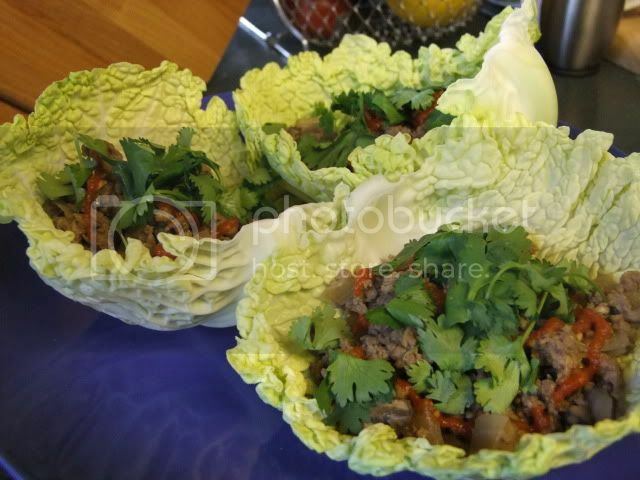 I'd originally intended to do lettuce wraps, but I couldn't find lettuce that would work well for wrapping, so I ended up using savoy cabbage. I find it actually works pretty well and tastes great, although it's maybe not as flexible as lettuce, so it's a little more prone to cracking and allowing drips. But if you're eating wraps with your fingers, you should be the sort of person who's okay with drips, right? Yes, I ate three of them. Actually, I didn't. I ate five. Once again, I sort of made this up as I went along. 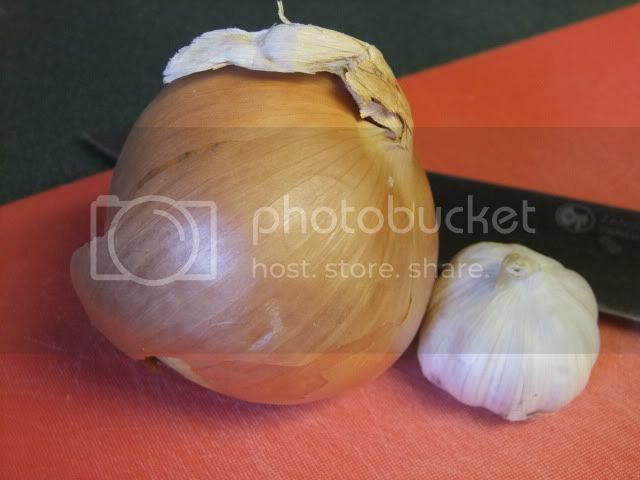 Onions and garlic are the default start to about 95% of my cooking. In a large skillet, heat coconut oil over medium heat. Add onions, cook until translucent, then add garlic and ginger--be careful not to burn them. Next, add the beef to the pan and brown it. Throw in the mushrooms, a good splash of tamari, and a glug of sesame oil. Cook for a few minutes until mushrooms are soft and it seems done enough. While filling is cooking, tear off some cabbage leaves and put them on a plate. Chop up some cilantro. 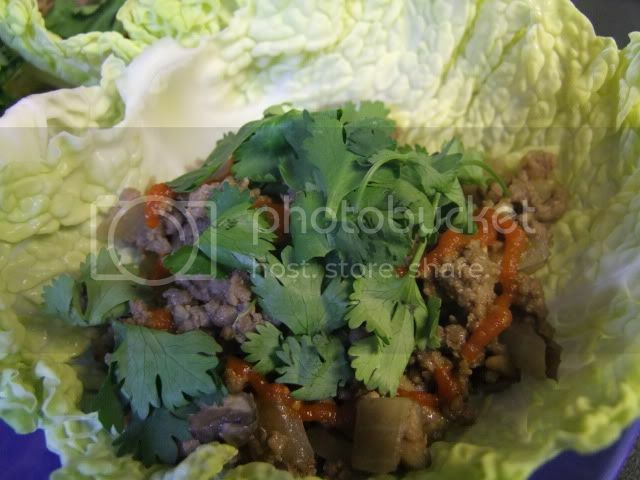 Fill leaves with meat and mushroom mixture, then top with a swirl of sriracha (yes, it's not paleo, and no, I don't care) and a sprinkle of cilantro. To eat, fold cabbage around filling with your hands. Expect that it will drip a little. That's okay, you can eat those bits with a spoon or do what I do if nobody's looking and lick your plate.